The front view is a little awkward, but I love the garter stripe. 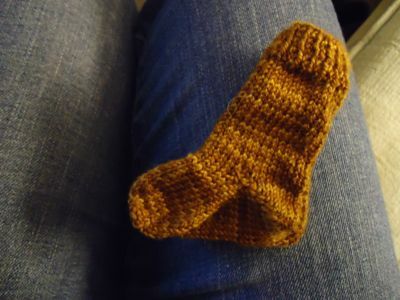 (In fact, that’s a big part of the name of this pattern: garter stripe baby socks.) 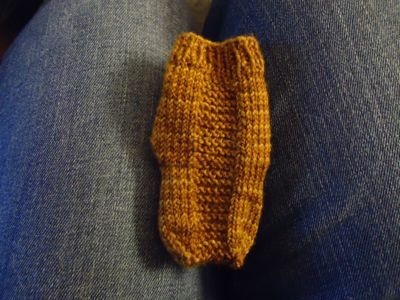 I made a few modifications after looking at ravelry projects: basically, I eliminated the toe ridge and knit a regular toe, kitchenering when I had 12 st remaining (6 front, 6 back). The good news? I think I managed to use my need to knit this booty to finish the revisions on my prospectus. It is sitting here, all pretty and printed out, waiting for me to read it one more time before sending it off to my chair. Sometimes I find it challenging to stop certain kinds of tasks from filling the time available (mostly my own writing, probably because it can always be better), and the deadlines I set for myself don’t always work. I may have met my (self-imposed) deadline for these revisions because of the firm deadline for the second booty. Maybe. Anyway, enough rambling about that. Time to walk Boh and knit this (adorable) booty!